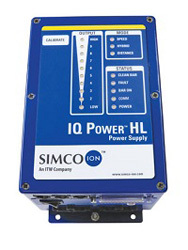 IQ Power HL & HLC Power Supply There are two power supply choices for the IQ Power HL System. Both power supplies are the heart of the IQ Power HL System because they not only provide the high voltage output power producing ionization, but they also process all of the system intelligence to maintain and communicate complete static control. Features include auto-calibration and dual-axis feedback control. Indicators on the HL power supply display system status, power, service status, and fault conditions. The HL power supply is approved for mounting outside the hazardous area, while the HLC power supply is approved for mounting inside classified hazardous locations. Through the use of the required remote display monitor you can calibrate with the touch of a button along with neutralizing all critical indicators such as service status and fault conditions. +/- 7kV "Speed Bar and Speed-T Bar"